Homemade sponge cake - great for a celebratory feast. Cake with a layer of meringue and marshmallow is always on the table worthy of note. The cake is tall, lush, fragrant and melts in your mouth. Prepare the sponge cake. For this 5 carefully remove the yolks from the whites and whisk with a glass of sugar and vanilla. The mixture should increase in volume and become white. In a separate bowl, whisk the egg whites with a mixer on medium speed until lightly and fluffy foam. A thin stream add sugar and whisk well the whites. Part of the whipped proteins add to the yolk mass, stir. Add the sifted flour and mix well. Then add to the dough with the remaining beaten egg whites and gently mix. Baking dish lightly greased with oil and cover with parchment paper. Fill in the form on 2/3 of the dough, as for baking the cake will increase in volume. Put in to bake the cake for 20-30 minutes at 180 degrees. Remove the finished cake from the oven and carefully cut it horizontally into two Korzh. Make the syrup. Mix jam with 1 tbsp water, heat in a water bath. Pour in the brandy and stir well. Sponge cakes impregnated with syrup. Whisk 4 egg whites with the remaining sugar and otkryvaem on baking some meringue. Prepare the cream. Soft butter, beat in a blender with condensed milk, until obtaining a homogeneous lush cream. Collect the cake. The first cake grease with butter cream. Spread on top layer of meringue. Marshmallows cut into small pieces and fill them in the gaps between the meringue. Then a layer of meringue cream lubricates, leaving a little of the cream to decorate the cake, and sprinkle with peanuts. Cover with the second sponge cake layer. The sides of the cake gently straighten, put some remaining cream. 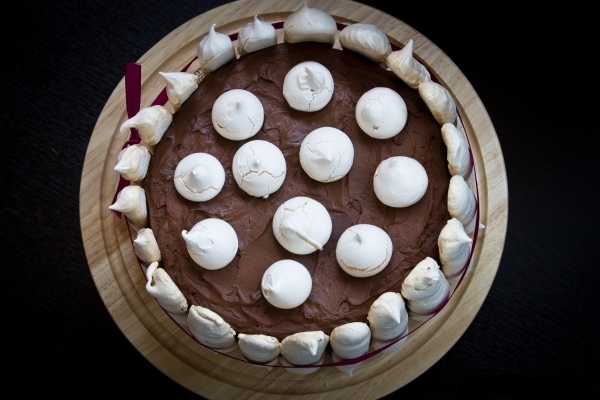 The top of the cake liberally grease with melted chocolate and decorate with the remaining meringue.